Have you ever stumbled upon an odd little enclave in a suburban or even rural area that feels like a movie-set version of a traditional town? Some of the aesthetic elements of traditional, walkable, human-scale urban design are there, but it just feels… off? And most likely, it doesn’t function anything like a real, organically-developed town center would, either. Today’s guest post from Kyle Sitzman examines such places and gives them a catchy label: Novelty Colonies. As our built environment becomes increasingly homogenous and grandiose, there is a blooming desire for society to return to settlements designed to the human scale. The revitalization of once-neglected small cities and towns across the United States is evidence of such demand. In response to this increased demand, a plethora of new places designed to emulate traditional development has also emerged. Unfortunately, some of these fall into a category I call Novelty Colonies: unusual and/or amusing, themed settlements whose model cannot be replicated in a sustainable manner. These settlements are distinctly unique when compared to the status quo, and they promise the resident an alternative to the vinyl-sided raised ranch houses of suburbia. However, the charm of these settlements is superficial, and they often fail to provide templates which can be expanded upon as a new way of building towns. Two such examples highlight what these communities have to offer, their missteps, and what we can learn from them. On the fringe of Philadelphia’s suburbs, in the heart of Amish country, stands a novelty colony of “affordable homes with a Bavarian flair,” or so boasts the website. The faux-Renaissance architecture and curvilinear streets certainly evoke the feeling of old Bavaria, but do not quite “mirror the charm of an Old World German village” as the developer promises. Stoudtburg Village. Source: Jonathan Smith via Flickr. Often when something new is made to look old, it is unsuccessful. In this case, the colony feels more like a Disney attraction than it does a re-creation of its intended vision. The charm of the center plaza and surrounding streets is that they discourage, and in some parts prohibit, automobiles. However, a large parking lagoon, built to accommodate one hundred vehicles, is the gateway for visitors to the colony. Future residents of the yet-to-be-built homes in the northern half of the colony will have to pass by this sea of asphalt and automobiles in order to access the center plaza. Another problem is that the site as a whole is built in such a way that will not allow it to be expanded upon. The outer loop road is closed unto itself and will eventually be lined by houses, whereas the curvilinear street design of the charming center plaza district could have been incorporated into the existing streets that surround the area. This essentially makes this colony only functional within itself. Instead of the first building blocks of something greater, Stoudtburg Village becomes just another stopping point in suburbia. 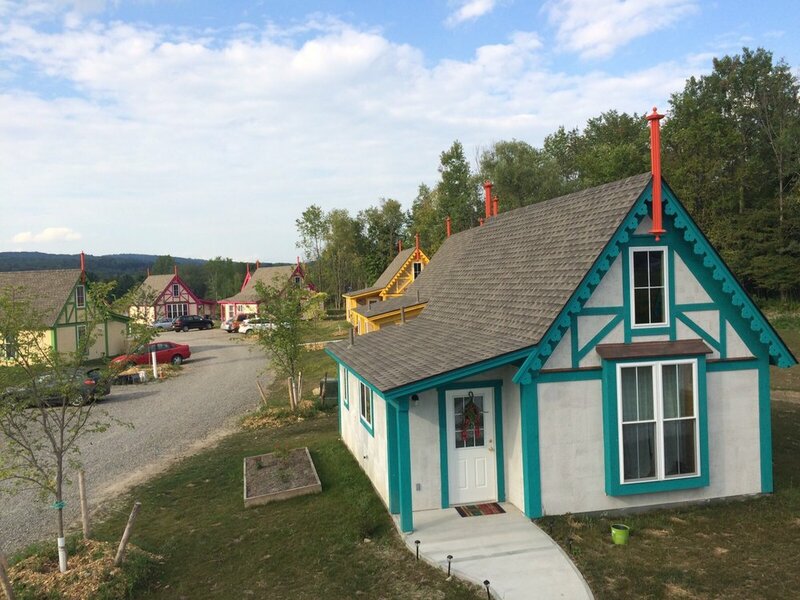 This tiny-home community about ten miles outside of downtown Ithaca is known for its children’s book-inspired architecture, with playful colors and steeply-pitched roofs. Despite the promise of a sustainable community, it is really just a subdivision of former agricultural land with caricature houses. The colony is entirely dependent upon the services of Ithaca and its suburbs. There are no businesses to speak of within walking distance of the neighborhood, just small cul-de-sacs arranged in such a way as to distract from their repetition. The developer boasts the availability of public transportation to the colony; however, the stop is by request only, and the bus drives by there only twice in the morning and twice in the evening and does not run to this location on the weekends. The colony does offer the sort of public amenities that any trendy neighborhood would have: a dog park, shared gardens, and a building for event spaces which resembles something like a church. However, to provide such amenities only to the people who live in the enclave is essentially like having a public pool in a gated community. The Hamlet of Brooktondale has a post office, a school, a couple of churches, and Brookton’s Market “local grocery deli store.” Yet the Boiceville Cottages are not incorporated into the tiny Hamlet of Brooktondale but set apart, reachable only by a sidewalk-less county road. The distinctions of these neighborhoods should not be overlooked. Despite their misguided approaches to community design, they are developed out of good intentions. They fill an important role in challenging the way we build our society. After visiting Stoudtburg Village, or driving by Boiceville Cottages, a return to the copy-and-paste architecture of a suburban subdivision will seem underwhelming. It doesn’t have to be this way, one might think. The giant, vinyl-wrapped dwellings of suburbia dwarf those Boiceville Cottages, yet are less luxurious. The sidewalk around the cul-de-sac is shared by neighbors, but will not foster the interactions had in the plazas of Stoudtburg Village. The Novelty Colony doesn’t have to take place on the outskirts of town. There can be creative building types on Main Street, or better yet, a public plaza can be Main Street. These ideas don’t have to be just a novelty at all. We can have compact housing units along our streets. We can value creative architecture over larger buildings. We can prioritize the human experience over the automobile. We need to harness the good intentions of Stoudtburg and Boiceville and incorporate them into our existing towns, or their novelty will soon wear off. The value of the Novelty Colony could provide the spark that ignites a conversation in the next strong town that decides it can do better than the status quo. When we exile the aging from our auto-oriented towns, where do they go? An assisted-living facility in Ohio offers a nostalgic, Norman Rockwell-esque setting modeled on traditional neighborhoods—the very sort of beloved, timeless places that we’ve all but stopped building in the real world. We can find practical examples of great communities far away from San Francisco or Copenhagen. If our historic downtowns had to follow present-day parking minimum laws, they would never be built. America's pre-Depression development pattern relied on exploitation of workers, poor living conditions and exclusion of women and minorities. How is the Strong Towns approach, which advocates for traditional development patterns, different? It is incrementally rising land values, combined with the ability to redevelop to something more intense, that naturally prompts the redevelopment of property in decline. Take away one of those two factors and redevelopment breaks down. Kyle Sitzman is a Landscape Architectural Designer and Urban Planner for the Westchester County Planning Department in the Hudson Valley, New York. In his free time, he advocates for restoring and protecting local watersheds.